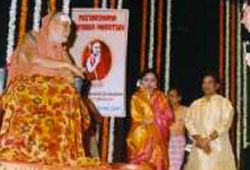 Sudha had the privilege of singing in the presence of Sri Jayendra Saraswathi Mahaswamigal, on the occasion of the Mahaswami Peetarohana Shatabdi Mahotsav in Mumbai 17 February, 2006. She was later felicitated by Smt. Shankar for her contribution in the sphere of carnatic music. An honour indeed, to sing in Mahaswami’s presence and to be lauded with the recognition.